Detailed review of Strivectin-SD Intensive Retexturizing Scrub. See how it stacks up against other exfoliators! Strivectin-SD Intensive Retexturizing Scrub is a very effective exfoliator for the face. It’s very effective, feels and smells nice, and really improves the skin over time. We noticed much smoother and more-even skin the longer we used this product. Overall, this is a very good exfoliator that comes with a very reasonable price tag considering it’s effectiveness. 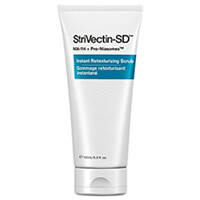 Strivectin-SD Intensive Retexturizing Scrub feels very much like a good face exfoliator should. By that, we mean it’s thick and you can feel very small jojoba beads. Larger “mechanical” exfoliation ingredients can be too damaging to the skin. The smell of this exfoliator is unique.. and actually quite refreshing to us. It has a light peppermint smell to it that we love! Strivectin-SD Intensive Retexturizing Scrub is a 2-3 times a week exfoliator. So it’s probably too potent to be used everyday. That said, applying this one is very easy due to the aforementioned texture. You just put a little in your wet hands, and rub gently onto the face and neck. It also washes off pretty easily. While I didn’t get any redness after exfoliating with Strivectin-SD Intensive Retexturizing Scrub, my skin did feel a little dry. It wasn’t anything too drastic as this happens from time to time when using an effective exfoliator. The results we got from Strivectin-SD Intensive Retexturizing Scrub were very good over time. Immediately after use, our skin felt tighter and very clean. Rough spots are smoothed out and fresh skin rises to the surface after repeated use. This exfoliator uses tiny jojoba beads and some coconut acid as it’s main exfoliation ingredients. It’s also got sunflower seed oil and oat bran extract in it to help with moisturization and skin conditioning. Nothing too exotic… but it gets the job done. This is one area where we really like Strivectin-SD Intensive Retexturizing Scrub! It costs $29.00 for a 3.3 oz tube which works out to $8.78 per ounce. For such a high-quality exfoliator, that’s a very good price and represents tremendous value. To buy Strivectin-SD Intensive Retexturizing Scrub, click here.